Stanley-Bostitch is known for its top quality manufacturing and innovative tools. The Bostitch F21PL has been advertised as a perfect nail gun for the contractors and weekend warriors, and it has justified the company’s name with its steady performance in the market. Here is the post of all its features, pros, and cons of Bostitch F21PL Nails. Product Dimensions: The Bostitch measures 23 x 16 x 6 inches and weighs around 9.1 pounds. With 1,050 inch-pounds of driving power, it has got one of the best power to weight ratio. Two Quick-change Nose Pieces: The best framing nailer comes with two nose pieces for easy switch between framing and metal connector application. Patented Push Button to Vary the Depth of Drive: It is equipped with a push button which allows the user to change the depth of drive with ease. Steel Guards with Anti-skid Rubber: The anti-skid rubber grip ensures easy and comfortable hold, and the steel guard provides the sturdy design. Type of Nails: The magazine can hold 60 plastic collated 21-degree framing nails(2.0-3.5 inch) or 60 metal connector nails (1.5-2.5 inch). Adjustable Rafter: It comes with an adjustable rafter, which can be used to hang the nailer during breaks. 7-year Limited Warranty: Bostitch F21PL is backed by 7 years limited warranty by Bostitch. 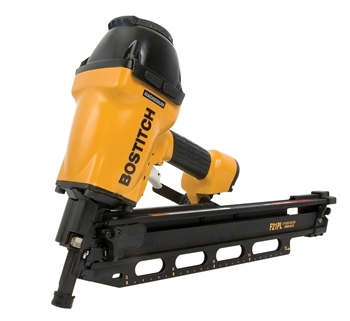 More Power with Less Weight: The Bostitch nailer is a powerful framing nailer with considerably lower weight than its counterparts. With its light magnesium housing, it’s not heavy on arm and shoulder even during the longer periods of job and yet is able to drive the nail through the variety of woods. Two Quick Change Nose Pieces: It comes with two different nose pieces. This helps the user in switching between metal connector nails and plastic collated nails easily and quickly. Durable: With its steel guards, the framing nailer is pretty rough and tough. Probably that is the reason, it is the preferred model used for renting. Ease of Depth Change: Depth of the drive can be easily varied using the push button provided depending on whether the user wants to toenail or flush nailing. Dual Operation Modes: It comes with the dual operation mode of single shot and bumps firing of the nails. As per the requirement of the job, the setting can be changed with the help of a switch provided for both the settings. Round Headed and HurriQuake Nails: Bostitch F21PL uses round-headed nails. It can also work with the HurriQuake nails. This makes it a perfect choice for the areas where clipped-heads are banned, or the areas which are disaster-prone and needs sturdier nails. Directional exhaust port: It is equipped with the directional exhaust port allowing you to change the direction of exhaust hot air away from your face. Noise: It makes a huge thump while being used in the single firing mode. The noise is comparatively louder than other brands. Finicky Usage: It needs certain practice to fire the nail continuously. The tip of the nose has to be depressed in “just-right” way before pulling the trigger. There might be some cases of misfire because of this. Difficult to Use in Tight Spaces: Although the BOSTITCH F21PLis light in weight, it has a beefy look. Because of its big size, it is difficult to maneuver in the tight places. No Case: A case would have been the good option especially for the users who intend to use it only during small jobs on weekends. Bostitch F21PL can be used for both small repair works and full-time construction job. Its light weight combined with the powerful punch and versatile nail types makes it a perfect choice for all kinds of users. The BOSTITCH F28WW framing nailer remains one of the most popular nailing machines that are currently available on the market today. In particular, it is renowned for its versatility and durability. Over the years, it has been able to grab the attention of a good number of customers due to its uniqueness and effectiveness. It comes with a patented push button that is responsible for enabling the user to position the nail properly and push it up to the appropriate depth. Within a few minutes, a good number of parts of your frame or deck will be in their right positions and in line with your personal preferences. This ability to perform works conveniently and quickly accounts for the popularity of the unit. The following is a review of this amazing product. Highlights about the BOSTITCH F28WW including its pros, cons and an average user rating will be included in the review. A conclusion about the framing nailer will also be available. Easy to Use: This BOSTITCH F28WW is one of the easiest nailing products that you can ever come across. The control buttons are positioned properly and conveniently. This means that users can easily get their work done without encountering any complications. Powerful: Despite being light, the nailer does not shy away from positioning and pushing the nail into the appropriate object. It does not matter if you are dealing with wood, masonry or metal; this nailing unit will help you to conveniently position as well as push the nail right through your desired object. Versatile Product: You can use the nailing product for the execution of a number of tasks. It does not matter the kind of nailing task that is at your disposal. This unique nailing product can help you to piece together different pieces of wood, metal or a combination of the two. For example, you can attach wood to masonry using the nailing machine. Alternatively, you can also the product to attach wood to a piece of metal. Using the power of the nailer, you can conveniently push a nail into any supported material. It Works with a Wide Range of Nails: It works with the most common nails in the industrial sector. It works with the nails whose size ranges between 2 and 3.5. It comes with more than 1000 inch-pounds of power for driving any supported nail into an object. Lightweight: Despite having a lot of power, the framing nailer has been designed with a weight of only 7.6 pounds. Operates with a Variety of Pressure Values: Set the pressure and then adjust the depth of the nail accordingly. In general, a pressure of 80 Pa is often enough for most of the tasks. But, you can vary the pressure accordingly in case the need arises. Operates with a Specific Nail Size: In general, nails whose sizes range between 2 and 3.5 inches can be handled by the framing machine. Special Features: When using the BOSTITCH F28WW, you do not need to constantly adjust the pressure. All you have to do is to set the pressure in line with the demands of the task, while adjusting the depth of the nail until it reaches your desired depth. It is a lightweight framing nailer. It can be used for many framing tasks. It comes with many protective features. Care must be taken when using the framing nailer to avoid any injuries. Size of framing nails is specific; only nails whose size lies between 2 and 3.5 may be framed. The BOSTITCH F28WW framing nailer is a perfect nailing machine whose popularity extends across the entire industrial sector. It can be used for both domestic and industrial purposes. Based on its versatility and convenience to use, the BOSTITCH F28WW is worth rating as a five star product.